Red Earth is a recognised Jane Iredale stockist. We have a wide range of Jane Iredale products available to buy in salon. To confirm any wedding service a £50 non-refundable deposit is required at the time of booking. This is then redeemable against services delivered on your wedding day. Trials – paid at time of trial. The remaining balance of all wedding services must be paid 7 days prior to your wedding day. 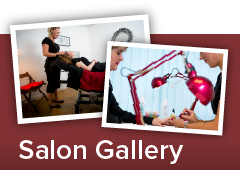 Travel fees will be charged at 45p per mile outwith a 10 mile radius of the salon. Should you cancel between your booking date and the date of your wedding, your £50 non-refundable deposit will be retained.